Chinook Salmon Limits 2/day - 4 in possession, for areas 10,11,111. Halibut retention options- 1)1 in Possession up to 126 cm(60 lbs). Situated on the North end of Vancouver Island, British Columbia, Canada, we have become established as one of the main operators of Port Hardy fishing charters. This bustling port, just north of Port McNeill, is the hub for perhaps the best access to BC west coast sportfishing, whale watching and wildlife viewing. Starfish Charters specializes in BC west coast deep sea fishing. Drawing on his years of experience on Vancouver Island waters, Ryan takes up to 4 guests, usually family groups, small companies or friends with a love for angling in common, out to the waters of Queen Charlotte Strait, Queen Charlotte Sound and neighboring Smith and Seymour inlets. And if you’ve never been to this piece of British Columbia paradise before, you’ll soon discover that guided fishing, with Bald Eagles soaring overhead, is one of the most enjoyable ways to discover this region. Check out our 2018 Photo Gallery! Fishing guide Ryan Haines will bring to you an unforgettable experience for anglers and sightseers of every age. With Starfish Charters, you’ll relax and enjoy the breathtaking scenery and sightseeing, wildlife and ocean wilderness, and the thrill of hooking salmon, halibut, lingcod or red snapper. Our Pledge at Starfish Charters is to provide an outstanding excursion into the British Columbia westcoast ocean wilderness; whether it be for angling, marine life viewing, kayaking or wilderness camping. "I've fished all over the world but nothing is better than the scenery and angling in the Port Hardy area, just a few short hours north of Victoria, on Vancouver Island." My biggest thrill is guiding you to where you can hook your own big one - whether it's halibut, salmon, lingcod, Red Snapper or Albacore Tuna. The 2802 Bayliner Trophy is equipped with 2014 Twin Mercury Verado's, The engines are 4 stroke 225 hp, They are very quiet and virtually smoke free allowing you to enjoy your fishing experience even more. The engines are maintained and serviced every 100 hours. The Vessel is Transport Canada (Coast Guard) certified with annual inspections. All of the safety gear is top of line. The boat is equipped with GPS,Ritchie Compass Radar, hydrostatic inflating PFD's, SOLAS PFD's, EPIRB (Emergency Position-Indicating radiobeacon), 5 different styles of Flares, 2 VHF radios & 1 hand held VHF. Bookings are now being accepted for 2018, but please note that space is limited. To reserve your sportfishing adventure, please click here to contact us or call Toll-free 1-888-363-4741. We’d also like to invite you to visit our salmon, halibut and red snapper sections to learn more about adventures from Port Hardy on Vancouver Island, BC, ... home to our capital city of "Victoria". Located on the northern end of Vancouver Island, Port Hardy is the hub for some of the best west coast sportfishing. 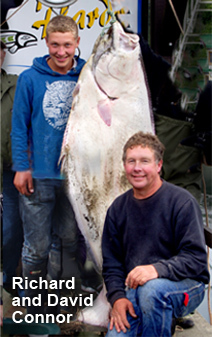 Depending on the season, anglers enjoy Salmon, Halibut, Lingcod, and Red Snapper (Yellow Eye Rockfish). If the Japan current brushes close to our waters late summer we'll chase Albacore Tuna. All this in the waters off Port Hardy and the waters of Queen Charlotte Strait, Queen Charlotte Sound and neighboring Smith and Seymour inlets. From deep water fishing to whale watching ... along with sightseeing and enjoying the spectacular BC scenery and ocean wilderness off the northwest coast of Vancouver Island. Your Starfish Charters trip will build a treasured memory that will last you a lifetime!